Vibration belts are modern vibration machines for active body relaxation. They effectively help with losing excessive weight and with muscle relaxation. Vibration belts inSPORTline stimulate blood circulation and the lymphatic system, strengthen arm, leg and abdominal muscles as well as the glutes and prevent water retention. 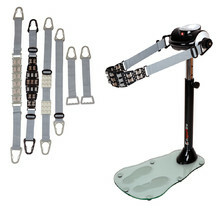 Every product has an assortment of different belts, each with a different effect on the body.